Having manipulated water for irrigation, energy, and burgeoning urban centers, humans are facing the reality that although fresh water is renewable, it is as finite as any other resource. Countries, states, and cities are now scrambling to develop an intelligent, well-informed approach to mitigate the growing global water crisis. Water Ethics is based on the belief that responding to contemporary water problems requires attending to questions of value and culture. How should we capture, store, and distribute water? At what cost? For whom? How do we reconcile water's dual roles as a practical resource and spiritual symbol? 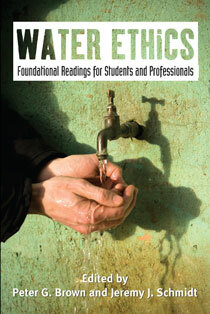 According to the editors of this collection of foundational essays, questions surrounding water are inherently ethical. Peter Brown and Jeremy Schmidt contend that all approaches to managing water, no matter how grounded in empirical data, involve value judgments and cultural assumptions. Each of the six sections of the book discuses a different approach to thinking about the relationship between water and humanity, from utilitarianism to eco-feminism to religious beliefs, including Islam, Hinduism, and Christianity. Contributors range from Bartholemew, Ecumenical Patriarch of the Orthodox Church to Nobel Laureate economist Elinor Ostrom and water policy expert Sandra Postel. Each section is framed by an original introductory essay written by the editors. Water Ethics will help readers understand how various moral perspectives, even when unstated, have guided and will continue to guide water policy around the globe. "Peter Brown and Jeremy Schmidt have provided a timely, major contribution to the evolving study of water ethics. Readers will find seminal articles on a wide range of topics, from water resource management to property, rights, and policy priorities. Provocative and challenging, Water Ethics is a necessary read for guidance on water ethics and indeed the general human/nature debates currently shaping key policies." "The way we are currently managing our global water resources has created a crisis. This important compendium goes a long way toward making sense of the often contradictory contemporary opinions on how to achieve sustainability. It proves that we must reconcile the ethics that drove water management decisions in the past with moral principles that respect ecosystems and future human life." "I was fully engaged—heart and mind—as I read Water Ethics. For me, some of the philosophies expressed have moved me to action...I am glad that I read Water Ethics and I would not hesitate suggesting it to my colleagues...an emotional component espoused by Water Ethics is lacking in a purely reductionist view of water." "[...] through offering this complex set of thoughful if sometimes mutually discordant essays, and in sewing them together with introductory remarks and the concluding chapter, the editors have defined a messy frontier where cultural values (ethics) manifest in water policies. More than delineating that frontier, Brown and Schmidt help us understand how that frontier has developed, how it seems to be changing (some signs of hope here), and where they think we need to go (compassionate retreat). For these reasons, this book is an invaluable addition to the set of resources available to water managers, policymakers, researchers, activists, and the residual category of 'concerned citizens.'" "As we move into the next decade of the new twenty-first century, perhaps no other issue will stamp its imprint on our consciousness as much as the global water crisis...Editors Brown and Schmidt have assembled eighteen essays that span one hundred years of ethical reflections on water, from 1909 to 2009, including their own carefully crafted concluding essay. The book is arranged as a chronology of understandings surrounding water ethics, understandings that have driven water policies and practices. The reader, then, is able to move through developments as they occurred in light of previous approaches. At the same time, the book spans a wide variety of philosophical and theological approaches...Although there is no one particular ethic that emerges in these collective writings, Water Ethics offers a glimpse of a major revolution in thinking about water and water issues. In addition to the general principles and philosophical arguments developed in the book, several authors utilize case studies to support and illustrate their positions. As the subtitle of Water Ethics indicates, these writings are not meant for a casual reader but are directed at students and professionals who work with water concerns. These concerns will certainly intensify in the next decades, and therefore, Water Ethics is a critical resource for current and forthcoming debates." "Peter G. Brown and Jeremy J. [Schmidt] have taken upon themselves the challenge of putting ethics on the agenda of water experts (be it professionals or students). ...the book presents an invitation for applied philosophers (be it social, political, or moral philosophers) to join social scientists in developing an ethics of water governance. For ethicists, it is the challenge to go beyond traditional environmental ethics and to develop an ethics that does justice to the particularities of water. This book sets a modest first step for exploring this new terrain." "This book sets a modest first step for exploring this new terrain." Chapter 19. Are There Any Natural Resources?